This next recipe courtesy of Cooking Creation just looked too good to not share with all of you. Try this spinach stuffed Cajun chicken to add a little excitement to your menu. Prep time is only about 15 minutes, then pop them in the oven and voilà. At Passanante’s Home Food Service we know our customers are passionate about food which is why we offer a product guarantee with each and every delivery. That’s right, if you’re not completely satisfied with your order we will exchange it for FREE. If you’re not already a happy customer give us a call at 1-800-772-7786 to schedule an appointment with one of our fantastic representatives — we guarantee you won’t regret it! 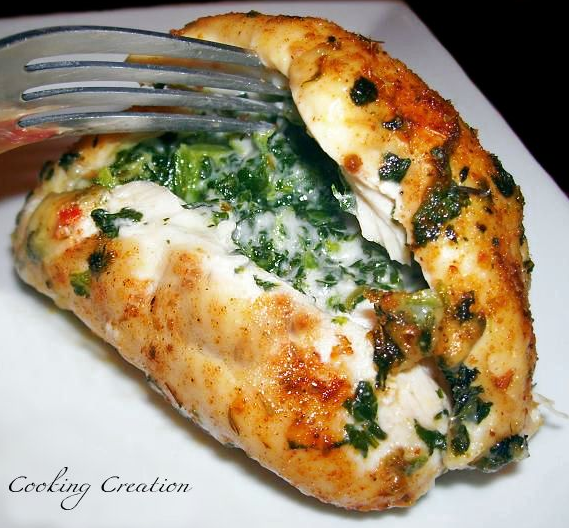 This entry was posted in Poultry, Recipes and tagged Food Delivery Service, Grade A Poultry, Hormone-Free Poultry, Organic Vegetables, Passanante's Home Food Service, Recipe, Spinach Stuffed Chicken by Passanante's Home Food Service. Bookmark the permalink.